Whatever you read on my blog comes from the bottom of my heart. Only the truth. And when I say our family uses at least 4 x 330ml of Alcohol on a monthly basis, I am NOT lying! Even before turning into a Biogenic Ambassador, I sometimes order a BOX of Biogenic Alcohol from the supplier just to get discounts. What do I do with Alcohol aside from using it at home and making sure to keep my son safe from germs and bacteria? I have several Beauty Hacks using Biogenic Alcohol. Yes, you read it right. It is a Beauty Hack and that's the reason why I picked Biogenic over any alcohol in the market because the scent won me over! Using alcohol to mend my broken powder compact, eyeshadow powders or blush powders. It is the worst nightmare of ANY make up artists when they drop their prized powder compact. Instead of moping at the corner and throw your shattered eyeshadow, blush or powder, DON'T! Here's what you can do. Add a few drops of Biogenic Isopropyl Alcohol, take a clean paper towel and gently press down the broken powder and smooth it. If the product is "too shattered", you may use a spoon and gently smooth the surface and leave it overnight. Aside from spoon, you may also look for a "heavy" product like this round glass packaging from Nuxe, use this to press the powder. Don't be too "OC" though, the result may not be as perfect as newly purchased but hey, better than not saving up ANY of the broken pieces right? Imagine your first client is sick when you put make up on her, don't you think using the same make up products on your next client could transfer germs and bacteria? 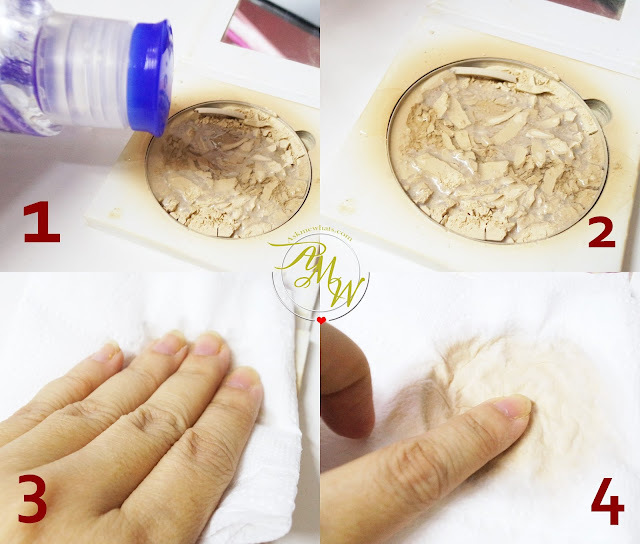 To keep your clients safe, sanitize your make up products by spritzing alcohol directly or on tissue then skim the tissue on the top layer of the makeup. 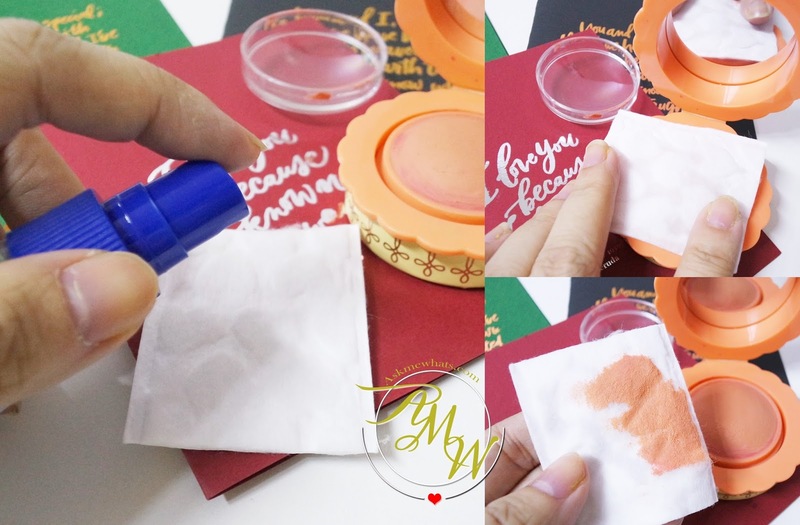 Now, added tip, for cream-based makeup like a cream blush, cream foundation, it is easy to spoil, mine went bad months before expiration date! Now here's a quick tip to prolong your cream-based products. Spritz alcohol on a tissue paper or in my case, a cotton pad. Gently press the pad directly on the product for 5-10 seconds (on photo: Benefit Majorette blush). Gently skim off the top layer of the make up before you store it. This won't harm your make up, it will just kill the germs! Disinfect your make up brushes as you condition it once a week. 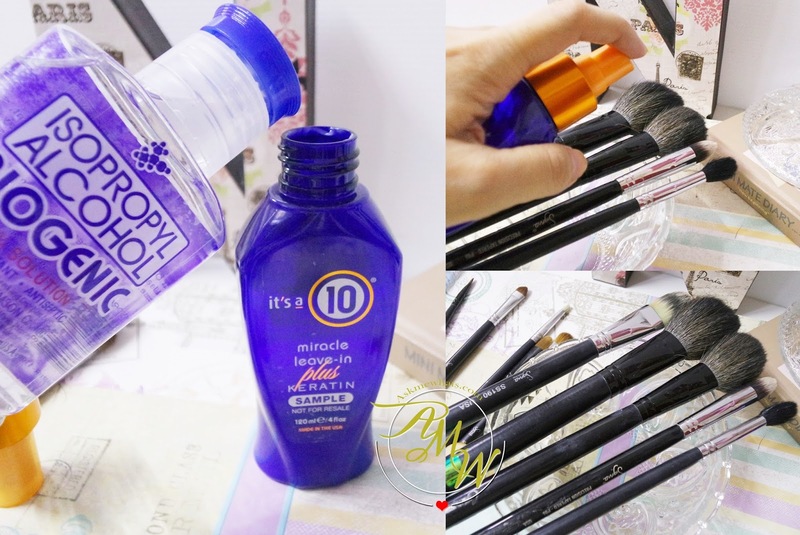 Instead of spritzing alcohol directly on your brushes with the possibility of ruining them. I like to share this handy tip I've been doing for YEARS, and all my brushes are still on tip-top shape! Purchase your favorite leave-in hair treatment conditioner (liquid form housed in spray-type bottle), add a bit of Biogenic Isopropyl Alcohol. That way, you kill 2 birds in one stone. Shall I say, you kill the germs and condition the hair of your brushes in one go! Disinfect all your make up products by purchasing a separate container with 50% distilled water and 50% Biogenic Isopropyl Alcohol. Now, do you understand HOW I CAN FINISH ALL THESE in a month or two? What are your other Beauty Hacks using Alcohol? Or any other Beauty Hacks you want to share? Super love your makeup brush hack I'll try it too! My family uses 2 500 ml bottles of alcohol on a monthly basis, so I totally can relate. However for overall sanitation, I like using Lysol aerosol since the mist is fine and not drippy. I do love your hacks though and will keep them in mind. Is it the same with makeup sanitizers?